Volcano Mulching is a No No! Do you like dead trees? Wish you had several of them in your backyard? Of course not! Nobody wants to kill a tree and keep it in their yard. However, no one really looks into how their trees are maintained either. If you wouldn't kill your tree on purpose, make sure you aren't doing it accidentally either; and keep up with correct mulching habits. I see this all the time when visiting with our lawn care companies in Atlanta Georgia. That's right, mulching, or incorrect mulching, can kill your trees. If you are like me, you had no idea. Just hire a professional and get it done right, right? Perhaps. However, without your own research and know how, how do you know which professionals will get your yard work right, and which will kill it? 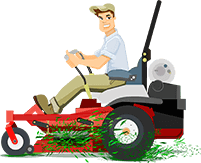 Lets say you're looking for a lawn service in Tampa, Fl, how can you tell if they know their stuff? Many professional landscapers use a volcano method of mulching around trees. This is not a good way to mulch around trees as it causes too much moisture to build up around the root ball. This can lead to fungus, rot and decay and ultimately lead to the trees death. Volcano mulching looks pretty aesthetically pleasing. Knowing what harm can befall your trees should you choose to do this method is important. Therefore, determine if you are going to be living in the same house for a while. If so, you'll want to determine if the tree you are using volcano mulching on can damage your home should it fall due to decay. If you aren't staying in the home for an extended period, say, 3-5 years, you may look into maintaining the trees a bit better as you do not want the next homeowner to get a surprise of a tree through the window. When mulching your tree, imagine it as more than just something that helps spruce up your yard. Imagine it as something that could ruin the yard completely if not done right. Your yard is an ecosystem, and just like in the rest of the world, if you take something out of the ecosystem, like a tree; it can produce lasting consequences that can drop the value of your home in an instant.